This summer, give your kids the opportunity to have lasting memories they will never forget! If you are looking to bring new waves of fun into your household for your children, look no further than Yamaha Raptor ATVs for kids! These fantastic ATVs are sure-fire ways to bring smiles to your children’s faces and laughter and warmth to their hearts. They will have the time of their lives riding around with you and their friends and family, wherever their ATV adventures take them. Yamaha offers three Raptor ATV for kids that are available in all different colors: white, purple, and blue. Each of these models is known for giving kids incredible rides while staying safe at the same time. Plus, in different colors, your children will enjoy having a personalized style that speaks to them. So come on! Let’s take a look at each of these models more in-depth and see how your family can begin enjoying them today. 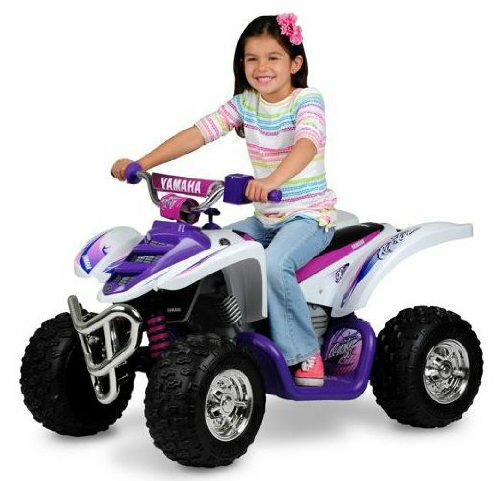 The Yamaha Raptor ATV 12-Volt Battery-Powered Ride-On (White) is perfect for kids ages three to seven years old. This ATV features authentic Raptor body styling similar to the real-life ATVs your kids might be seeing “big kids” riding around. As its name implies, this particular model shines with its white styling that also offers pink and purple supporting colors on the front handles and shields and also along the side footholds and rider seat. This kid’s ATV is powered by a powerful 12-volt battery and can operate for up to a few hours on a single charge. A charger is included with the purchase of this ATV. This ATV has the ability to travel in two directions, both forward and backward. It’s two direction capability allow it to be more user-friendly and life-like for your child, giving them the opportunity to travel everywhere they want to (with your permission). This is a great starter ATV for your children who are interested in one day having a real-life big version of their own! 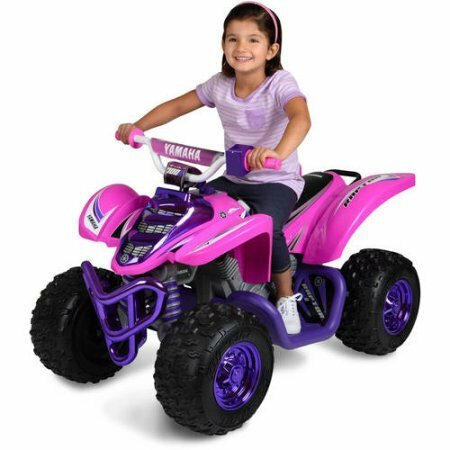 The Yamaha Raptor ATV 12-Volt Battery-Powered Ride-On (Purple) is perfect for those in your family who love purple and hot pink! This powerful kid’s ATV is striking to the eye and will be sure to bring a strong shining smile to your child’s face. It has deep purple hubcaps and front grill with hot pink side fenders and a chrome-resembling handlebar set. Hot pink handlebar grips will be fun for your children to hold on to with their might! This durable machine is propelled by a 12-volt battery that is able to last for a few continuous hours on one single charge. Indicator lights let you know when the battery is about to die and when it would be a proper and ideal time to begin charging. This ATV operates quietly as to not disturb your neighbors and those around you. The design of this ATV is just like the Raptors that you might see around you. Even more, there is a two-speed forward control that allows your little adventurer to travel forward at a slower pace or at a faster pace, up to 5 mph. The first speed control goes up to 2.5 mph. Additionally, a reverse option allows your child to back up anytime they need to. Battery requires 14 hours to recharge completely ~ Battery delivers 1 to 3 hours of continuous use per charge ~ Dimensions: 44" x 24" x 29"
The Yamaha Raptor ATV 12-Volt Battery-Powered Ride-On (Blue) is just like its brothers and sisters in white and purple. This ATV for kids features the same amazing characteristics as the other two models, just in a different color! 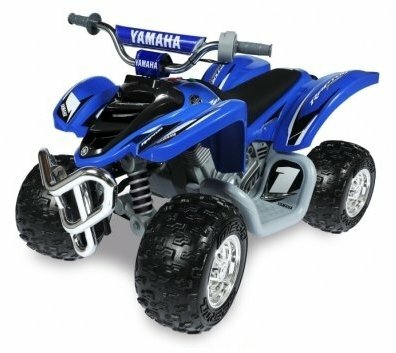 This version of the Yamaha Raptor ATV for kids has strong deep blue, chrome, and black features. The side fenders of this model are blue with chrome accessories and the grill itself is has a nice chrome-looking finish, just like the hubcaps on the tires. The seat of this model is black, fitting in perfectly with the rest of the color scheme. Powered by the same 12-volt battery as the other models, this version also has the two-speed forward feature, one speed that allows your child to travel up to 2.5 mph and the other that reaches the speed of up to 5 mph. It can also go in reverse when needed as well. The Yamaha Raptor ATV line for kids is perfect for the adventure-lovers in your family. Each of these models, no matter the color, is able to operate on multiple surfaces, allowing them to take their adventures wherever you want. Each model has two speeds plus a reverse speed. They are able to reach upwards of 5 mph in the forward direction. The Yamaha Raptor ATV line is made with durable construction and a strong steering wheel column that will help to keep your children safe throughout their entire ride. Each model features Raptor sound controls with signature race graphics and authentic designs throughout, no matter the color scheme and with only needing 20 minutes to be assembled, your child can begin having fun right away! This summer, give your kids memories that will last forever with their favorite Yamaha Raptor ATV! Available in white, purple, and blue, you can guarantee them good times with these fun toys. Check them out today! Or consider another brand like Razor Dirt Quad four-wheeler.